An old friend once told me "slides don't make themselves", well maybe I had to do some work but there is no way I could have designed this myself. 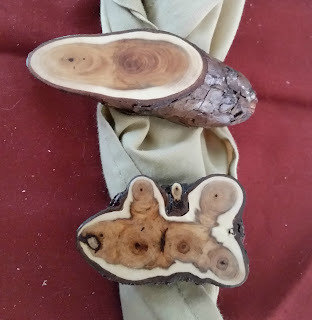 I was removing some bushes from around my house about a couple of years ago and I noticed the nice contrast in the colors of this wood. Thinking about a different project, I decided to keep a section of the trunk to see what I could do with it. Knowing the wood would have to be completely dry, I set it aside in my garage until this year. When I started to cut the wood up, I was amazed with the patterns I was seeing and these slides were started. Both were cut about 3/4 " of an inch and sanded smooth. I glued a wooden loop to the back and three coats of clear poly later they were ready to wear.